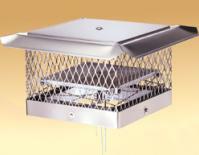 Lock-Top II continues the engergy saving features of the Lock-Top Damper with a special Gelco chimney cap. The Lock-top II comes fully assembleld, its base mounts to the top of the flue tile with silicone sealant, which is provided. A sweep's Ring is also included. A 30' stainless steel cable (included) drops down the flue, and a hardware set mounts in the firebox. 50' cables, and 4' cable shields are also available, must be ordered separately. The Lock-top II has a lifetime warranty and is available in 3/4" and 5/8" mesh. 6" X 6" to 9" X 9"
6" X 9? to 9.5" X 12.5"
6" X 14" to 9.5" X 17.5"
9" X 9" to 12.5" X 12.5"
9" X 14" to 12.5" X 17.5"
14" X 14" to 17.5" X 17.5"
6" X 9 to 9.5" X 12.5"
7" x 10" up to 10" x 13"